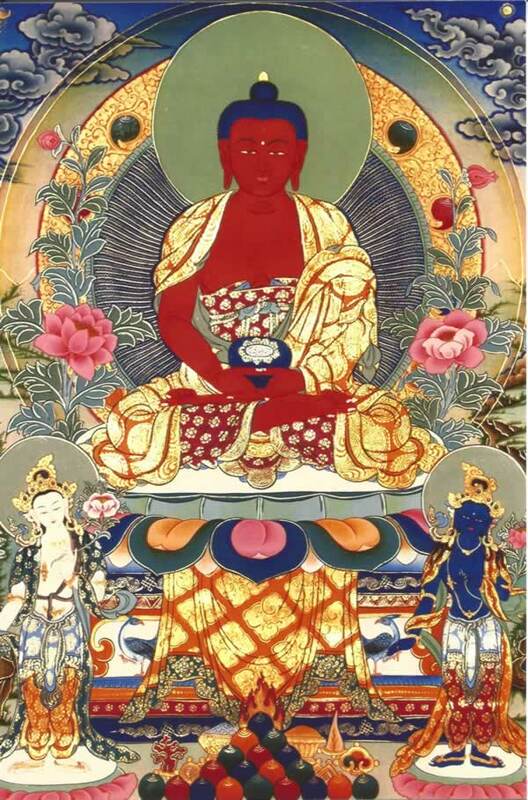 Amitabha is a Buddha who made the very special aspiration that he would cultivate bodhicitta (an altruistic mind that seeks enlightenment for the benefit of others) and work for the benefit of all sentient beings. In particular, the Buddha Amitabha aspired to create a “pureland” in which sentient beings could be reborn, should they form a connection with him. The pureland that Buddha Amitabha created is called Dewachen in Tibetan or, as per the text, Sukhavati (Sanskrit). In “embracing the pureland of Sukhavati” we aspire to be reborn there, in order to receive accelerated teachings in the most favourable environment possible. We do this not strictly for ourselves, but for all sentient beings; that we achieve enlightenment, the state of Buddhahood, as quickly as possible, for the benefit of all.